After striking out on Jerry Rice for the second time I decided to take a shot at Joe Montana. I had heard rumors that Montana signed TTM on occasion, so I studied his signing habits. It did not bother me that much that people said some of them were ghost signed, as there was no definitive proof of that. Once it came to my attention that the 49ers organization was having a sendoff to their former stadium, Candlestick Park, involving many former players in a flag football contest, I decided to make my move. Needless to say when I got the autograph in the mail I was very excited to have my crown jewel of 2014. Joe Montana’s career is defined by his late game winning mechanics, 3 MVP trophies, and four Super Bowl victories. A perennial thorn in my side as a LA Rams fan, Joe always had more than enough to beat them with his last second heroics. Still I couldn’t help admire his ability. It wasn’t always like that for Montana. A perennial student of the game, Montana had a penchant for late game heroics spanning back to his time at Notre Dame, but a separated shoulder during his Sophomore season buried him on the depth chart. He’d regain form in time for his Senior season, but wasn’t highly regarded by scouts who felt that his arm strength was underwhelming. He’d be the 4th quarterback off the board at the end of the 3rd round, (behind Jack Thompson, Phil Simms, and Steve Fuller), to the San Fransisco 49ers and head coach Bill Walsh. Walsh was running his West Coast Offense that he brought over from San Diego. Montana backed up legendary journeyman quarterback Steve DeBerg as he honed his craft in 1979. It wouldn’t be until midway through the 1980 season that Montana assumed the reins of the franchise. 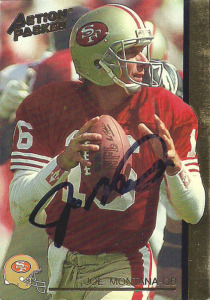 In 1981, a more seasoned Montana led the 49ers to consecutive victories over the Cowboys (“The Catch”) and their first SuperBowl appearance (XVI) and victory against the Cincinnati Bengals. Joe earned his first of 3 Super Bowl trophies for his efforts and MVP honors. He’d win his second Super Bowl in 1984 (XIX) beating the high octane Miami Dolphins offense led by Dan Marino, when Joe threw for a record 331 yards culminating in his second MVP trophy and Championship. In 1986, Montana suffered a near career ending back injury, but returned later in the year earning co-Comeback Player of the Year Honors with Vikings QB Tommy Kramer. Walsh was always looking to groom his heir to Joe Montana, and by 1988 with the Super Bowl memories starting to fade, a full blown controversy developed between Montana and newcomer Steve Young. The 49ers returned to the big game in 1989, and Montana led the team to a comeback last minute victory over the Bengals that year shattering the passing record again with 357 yards. In 1990, the indominable 49er dynasty looked unstoppable. Montana and the gang cruised to a 14-2 record, but Montana sustained a nasty elbow injury against the New York Giants during a loss in the NFC Championship Game. Still, he earned the NFL MVP that season. Joe would sit out 1991 and 1992 rehabbing his injury. In the meantime, Steve Young fully matured into the 49ers starting quarterback role. Montana was eventually traded to the Kansas City Chiefs in 1993, playing for the team through the 1994 season before retiring. Joe’s had his number retired by San Fransisco and was inducted into the Pro Football Hall of Fame in 2000. He’s also earned a bunch of retrospective All-decade honors and is considered one of the greatest quarterbacks in NFL history. Also of note is during the early 90’s Joe had his own self-titled NFL football game published by Sega that is rumored to be returning sometime soon.